Walking between the valleys of the Lake District can be hard work, the passes are high and, if you take to the fells themselves, very high. However it is also immensely satisfying. The bus drops you off in the small hamlet of Buttermere and a sheer wall of steep mountains appear to block your return. However there is a lovely path up the side of Sail Beck which cuts through the steepest of the hills. Once at the watershed it is little effort to ‘collect’ Ard Crags and then drop in to the lovely Newlands valley. After Ard Crags cross the road and follow a small lane to the pretty settlement of Littletown, visiting the nearby church enroute. From here the path skirts Catbells (feel free to climb it) before joining the Cumbria Way long distance path. The high fells dominate the views and offer an imposing but beautiful backdrop to a special Lakeland walk. Transport: Honister Rambler bus service. The 77 leaves for Buttermere at 10.20 and 12.05 and takes 40 minutes. There is an earlier bus (77a) that takes 50 minutes and leaves Keswick at 9.20. Start Point: Cross the river on the road from where the bus stops and take the path about 30 metres further on that heads right. Keep to the lower path where it divides so you remain close to the river. Terrain: The paths are all good and there is some road walking in Newlands. Eating & Drinking: The Swinside Inn is nearly enroute and a fineLake District pub but really there is nothing else. A coffeee in Buttermere will set you off though. Glad you enjoyed the walk, Newlands is great. No problem referring and linking from your blog page. I did this liner hike while we were in Lake district. One of the best hikes we ever did. Thank you for posting. 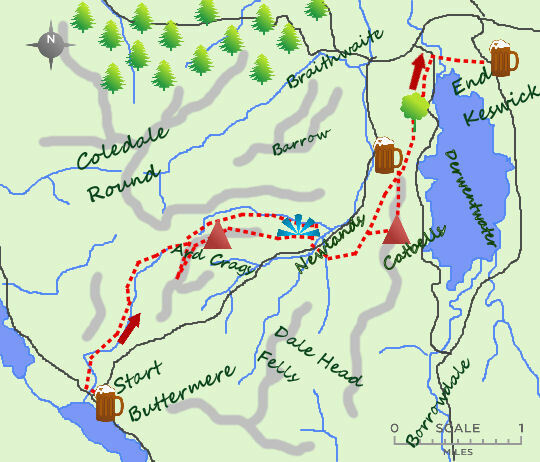 We thought that this route covers all the great scenery of Lake district. We did climb Ard Crags and Catbell, both are fantastic. Is it ok if I refer this page on my blog?